Family coat of arms, which dates from the 15th century. This coat of arms symbolizes for him the entrepreneurial spirit that has been the driving force now for over 150 years. 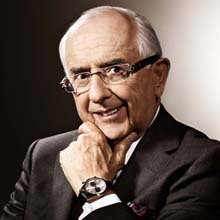 In 1963, Jack W. Heuer, the son of Charles-Edouard Heuer, started to work on a new chronograph specifically designed for drivers and motor-racing enthusiasts. A life-long fan of the sport himself, he knew what was needed: a wide-open, easy-to-read dial with a shock-resistant and waterproof case tough enough for road wear. 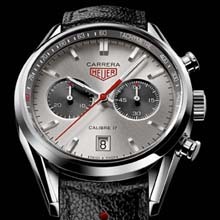 The following year he launched the result, a mechanical, manual-wound chronograph called the Carrera. For the name, he reached back to a racing legend from the 1950s, the Carrera Pan Americana, a five-day, 3,300 kilometers (2,100 mile) race across Mexico. The most prestigious — and dangerous — endurance race of its day, the Carerra, which in Spanish means “competition of the highest order” remains synonymous with excitement, danger, adventure, and heroism. It was the perfect name for Jack’s most ambitious creation to date. The elegant simplicity, purity and sobriety of the optimized dial design made the Carrera a huge success and launched a golden era of creativity and innovation for the Heuer brand. Among their first wearers were every Ferrari Scuderia driver — legends like Carlos Reutemann, Clay Regazzoni, Jacky Ickx, Niki Lauda, Mario Andretti, Gilles Villeneuve and Jody Scheckter. Other 70s greats also wore the watch, including Jo Siffert, Ronnie Peterson, Emerson Fittipaldi, Denis Hulme and John Surtees. 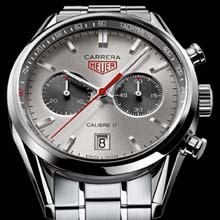 Jack W. Heuer’s all-time favorite watch, the extremely rare Carrera 18ct Gold, dates from this era. The men who wear the CARRERA CALIBRE 1887, like Leonardo DiCaprio, have no reason to show off. They know who they are and what they want. They epitomize class and elegance, which comes naturally. Effortlessly. Masters of the fastest pace, they never rush. They take their time. They control every moment.